From the writer/producer of Kickboxer: Vengeance Dimitri Logothetis now directs the latest instalment of this martial arts saga. It is set just over one year after the experiences of Kurt Sloane (Alain Moussi) in Thailand against Tong Po. After avenging his brothers death, Kurt Sloan (Alain Moussi, Kickboxer: Vengeance, Wings of the Dragon) is living the dream life as a professional mixed martial artist, but is troubled with recurring nightmares of him and his wife Liu (Sara Malakul Lane, The Domicile) on a train being attacked by a mysterious man and woman. He creates a new move to defeat an opponent to become champion and after the fight he goes to the locker room where two U.S. Marshals say that he has been implicated in the death of Tong Po and must go back to Thailand to defend himself. Kurt asks to see their badges again, but as the marshal goes to get the badge out Kurt is tasered and wakes up in a Thai prison cell. Kurt is soon brought in front of the man who runs the prison and the underground fight tournament that Kurt, Eric and Tong Po have fought in before, Thomas Tang Moore (Christopher Lambert, The Broken Key, Highlander). He wanted Kurt to be the new champion for his fight club, but Kurt returned to the states, so Moore had to find a new one, and he did in the 400lb and 6′ 10” Mongkut (Hafþór Júlíus Björnsson, Game of Thrones) and to put it simply Moore offers Kurt $1 million to fight Mongkut to the death. Kurt refuses of course and he’s sent back to the rest of the population within the prison, a lot of whom were fans of Tong Po. With his life in danger at every turn Kurt has to prove himself to the rest of the inmates. This is where we first see Moussi’s skills in this procession fight sequence as he makes his way around the prison site. Victorious on the ground but this earns him the wrath of the prison warden and he is put to the lash each night. Kurt soon runs into the American boxer Briggs (Mike Tyson, Ip Man 3) after an impressive show of boxing vs Muay Thai. Afterwards they form a friendship as they both suffer the lash. Briggs agrees to help Kurt get through the pain. Kurt also finds out that his teacher, Durand (Jean-Claude Van Damme, Universal Soldier, Replicant) is here training fighters for the ring. Kurt wants to help and is dismayed when he finds out that Moore blinded him, however Durand does not see this as a hindrance as he has learned to use his other senses to compensate for his blindness. 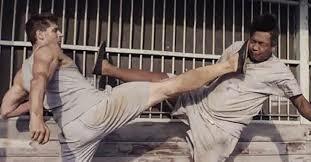 Now we have the training montages as Kurt learns the skills to defeat Mongkut and Moore. Definitely one for the martial arts fan of the home. It will keep you gripped to final kick. 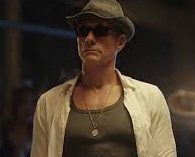 Kickboxer: Retaliation is available in Blu-ray and DVD.